The future of the global polyurethane tooling board market looks good, with opportunities in aerospace & defense, automotive, marine, wind energy, and others. The global polyurethane tooling board market is forecast to grow at a CAGR of 5.6% from 2016 to 2021. The major driver of growth for this market is increasing usage of polyurethane tooling boards in the automotive and aerospace industries due to low cost and shorter prototype production time. Emerging trends, which have a direct impact on the dynamics of the industry, include the development of high temperature resistance and custom sized tooling boards. A total of 79 figures / charts and 30 tables are provided in this 110-page report to help in your business decisions. Camtek (Sika), RAMPF Tooling Solutions GmBH & Co. KG, General Plastics, OBO Werke, and CMT Materials are among the major suppliers for the polyurethane tooling board. On the basis of its comprehensive research, the author forecasts that the automotive and wind energy markets are expected to show above average growth during the forecast period from 2016 to 2021. Q.1. 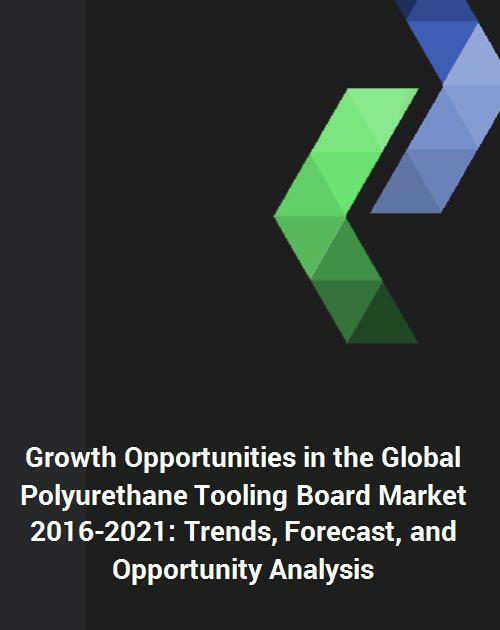 What are some of the most promising, high-growth trends in the global polyurethane tooling board market by end use industry (aerospace, automotive, wind energy, marine, and others) and region (North America, Europe, Asia Pacific, and the Rest of the World)? Q.4. What are the key factors affecting market dynamics? What are the drivers and challenges in the market? Q.7. What are the changing demands of customers in the market? Q.11. What M & A activities have transpired in the last 5 years in this market?